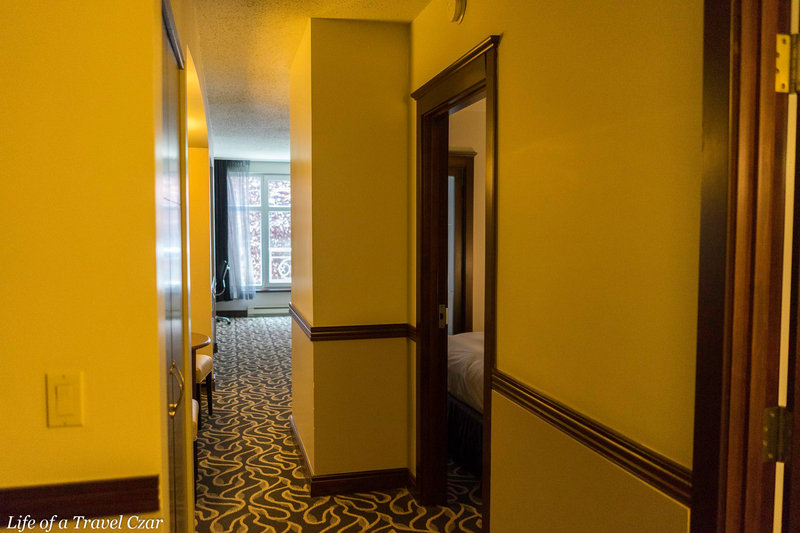 Situated in Old Montreal and surrounded by the grandeur of the Basilica of Notre-Dame and the beautiful gardens of the St Sulpice Seminary, this quaint hotel is situated on a beautiful narrow cobblestone street just a few blocks from the St Lawrence River. 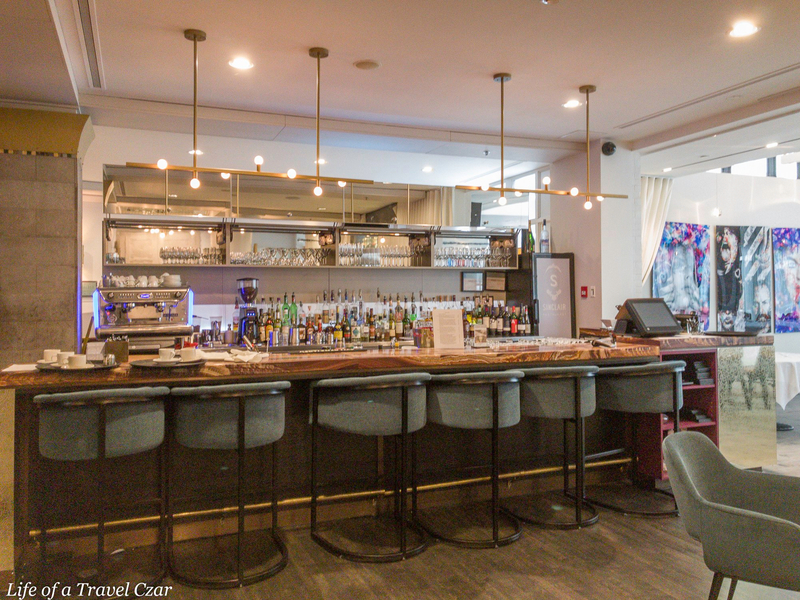 The hotel is surrounded by beautiful cafes, shops and charming bistros (you can check out some of these in my Montreal Guide here). The lobby is understated with an expansive area supported by columns with a few steps down to the bar and restaurant area. The bar area is quite quaint with funky sofas and chairs and a wall laden with modern art. The restaurant has a tree-lined open air courtyard which is quite beautiful on sunny days. 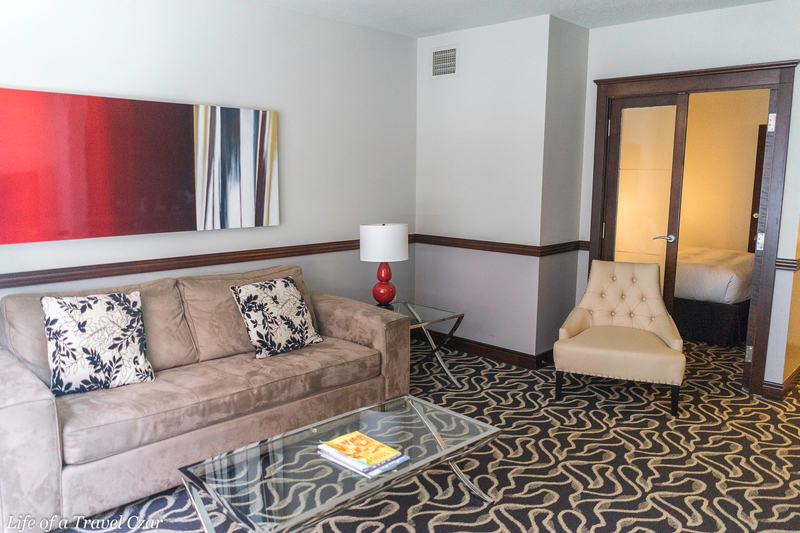 This Hotel is an all-suite hotel with the attitude that studio rooms are so yesterday. 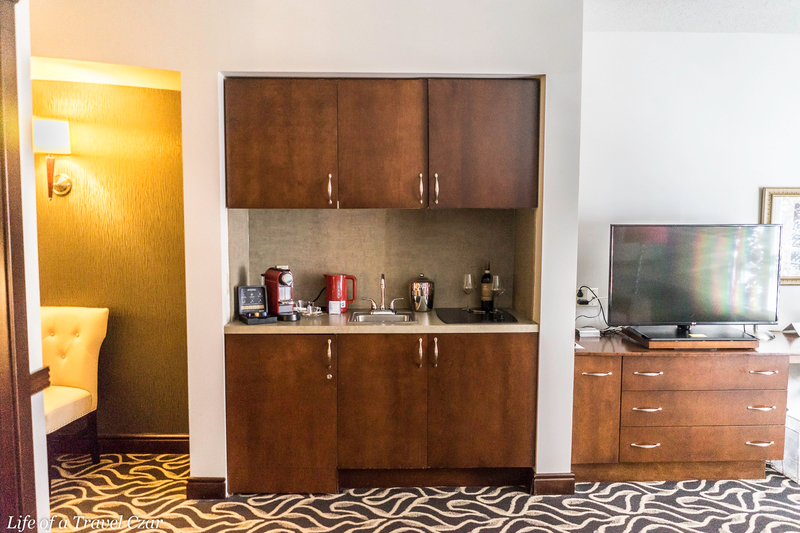 Each room comes with a lounge area, sofa, armchair, writing desk and a pretty comprehensive mini kitchen. 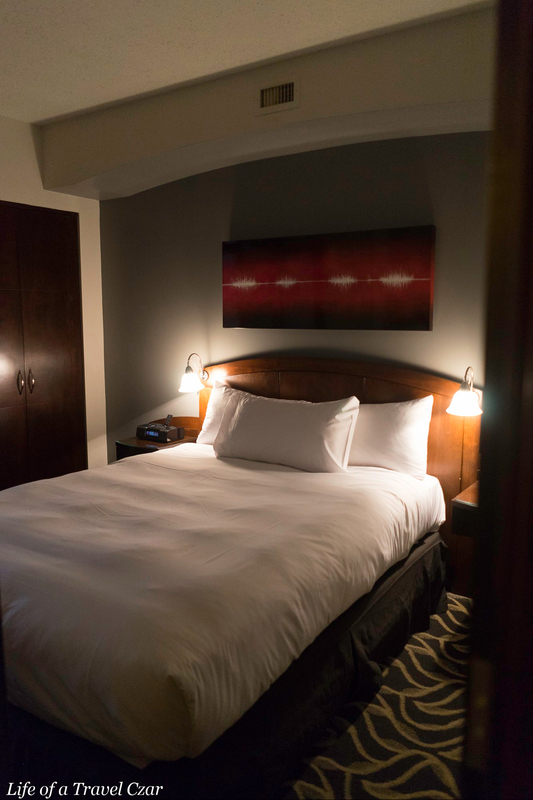 The rooms have an interesting colour palate of dark chocolate wood, light greys, browns and creams with red lampshades and redish abstract art work. 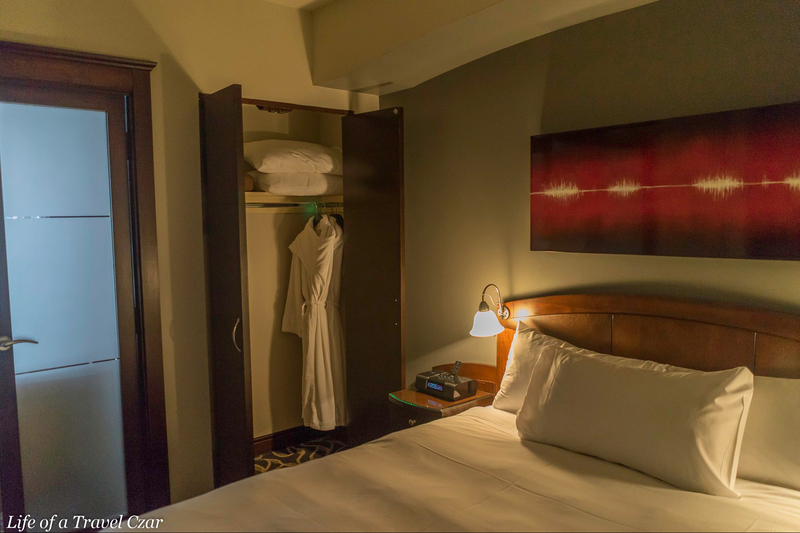 The bedroom is quite cosy, with ample storage areas, a TV, beautiful artwork and a pretty comfortable bed. The bathroom is a bit of a let down, they have been renovated, but there isn’t the glam touch you’d expect from a suite hotel. But what it doesn’t have in bling it does have in usefulness. 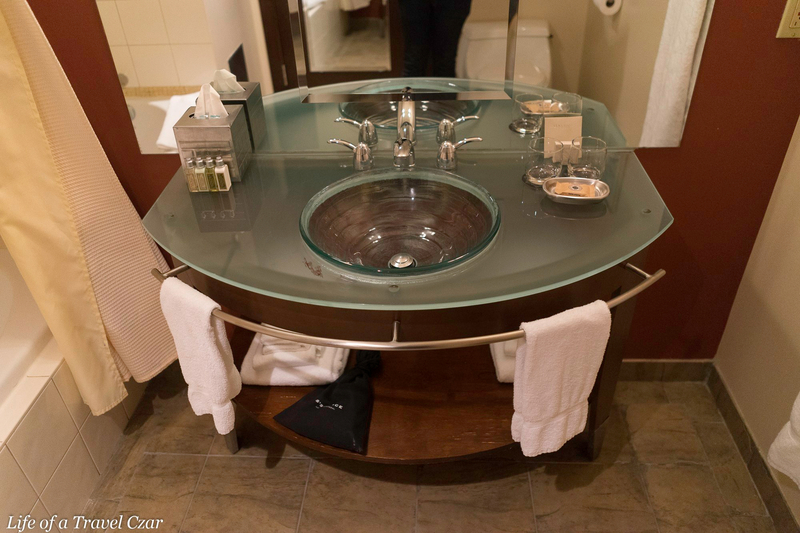 There is a glass basin with easy hanging spots for towels. 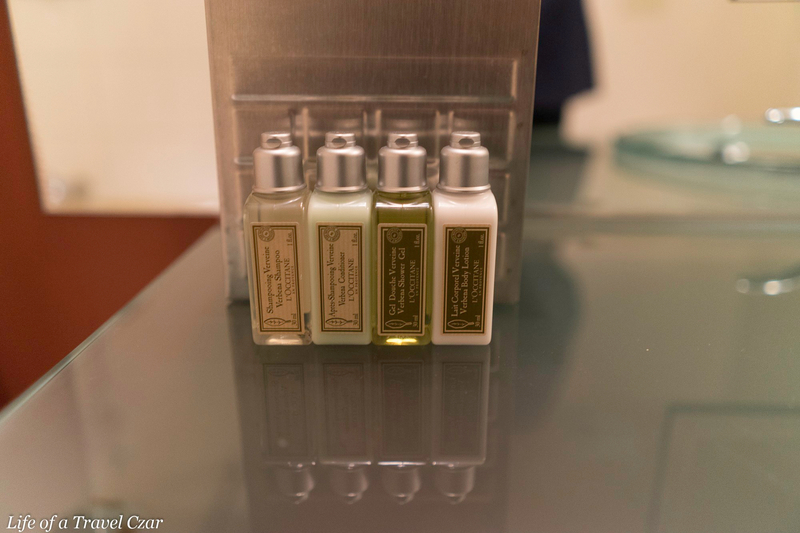 The bathrooms are stocked with L’Occitane’ products. 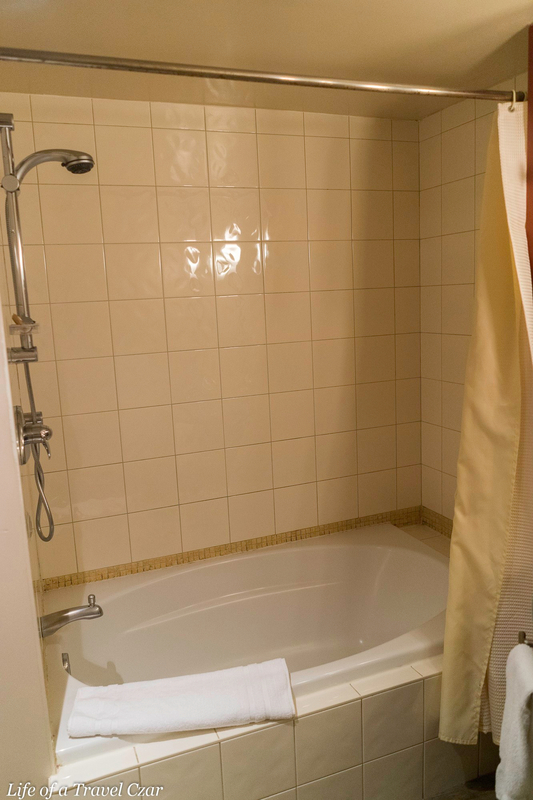 The bath area provides a decent size bathtub and shower with decent water pressure. The kitchen area is quite compact but with all the requirements for a self contained stay. There’s a fridge, and microwave, a Nespresso machine, mini ice bucket and cutlery, plates and kettle. 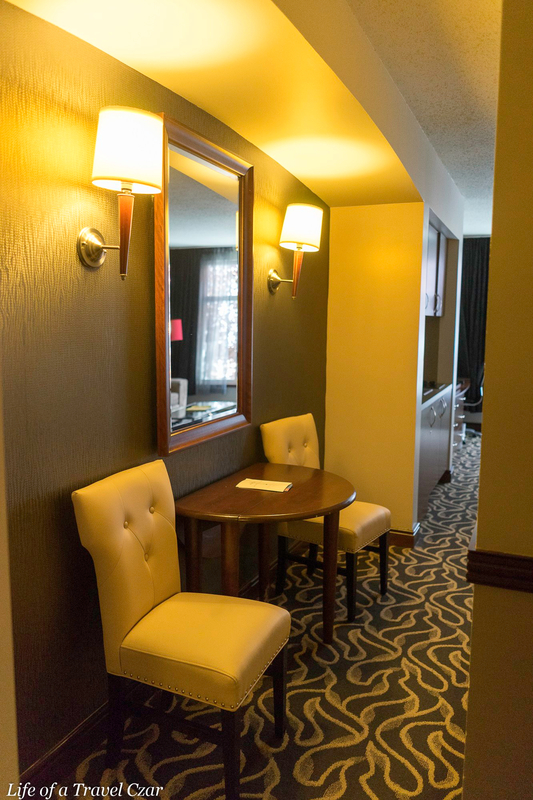 Outside the bedroom there is a mini sitting table and walkway into the lounge area. 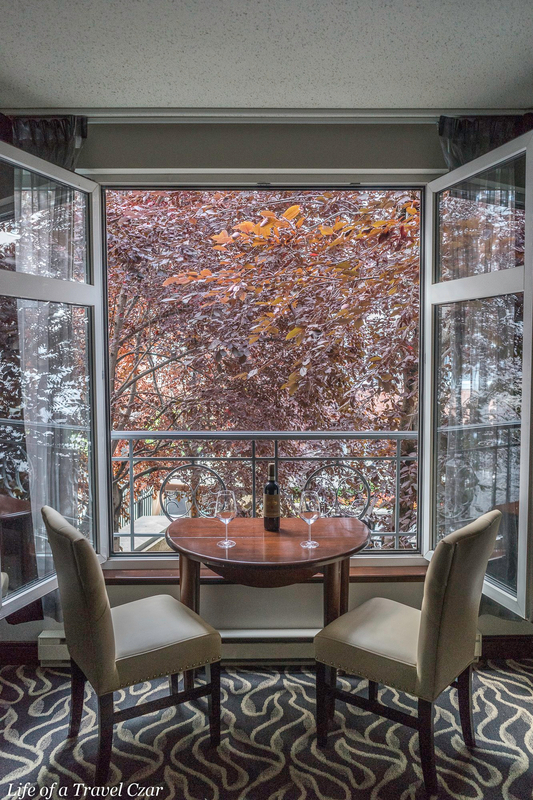 The lounge area is full of natural light and beautiful large windows which open into the courtyard. It is littered with trees and squirrels and is the perfect spot to gaze at as the sun sets on the day. The most enchanting experience you’ll have is being perched on the beautiful cream leather chairs, running ones fingers sensuous across the wooden grained surface of the antique table as the cool breeze gently sends a tingle down your spine. As the day’s end approaches, the falling autumn leaves capture one’s gaze in hypnotic fashion. The sight of innocent scurrying squirrels and beautiful birds seeking refuge in the branches sets an example for our carefree existence. The flow of wine this evening is effortless as the mise en scène – life is both a sensory experience of romance, tastes and soulful touches. It is a beautiful way to spend the day after a long day of walking through the streets of Old Montreal. 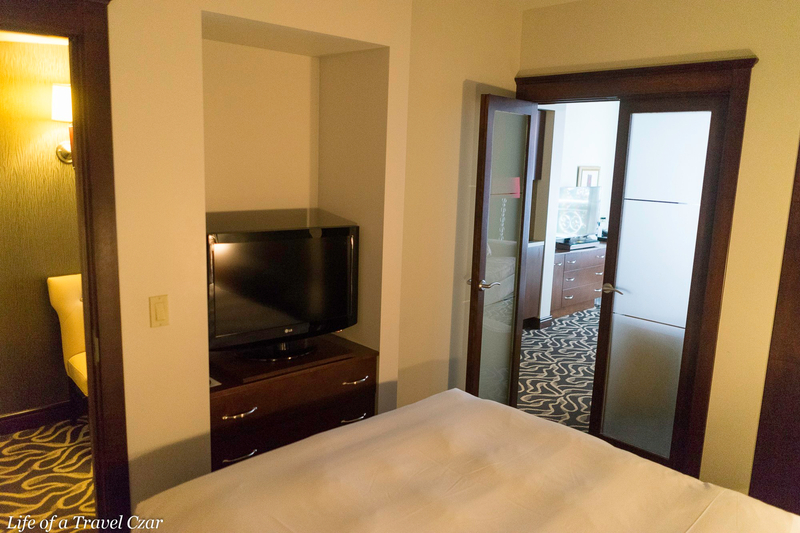 The suite is quite spacious, so here is a little video tour of the suite. The tune is Warm in the Winter by Glass Candy. I do not own the rights to this song. 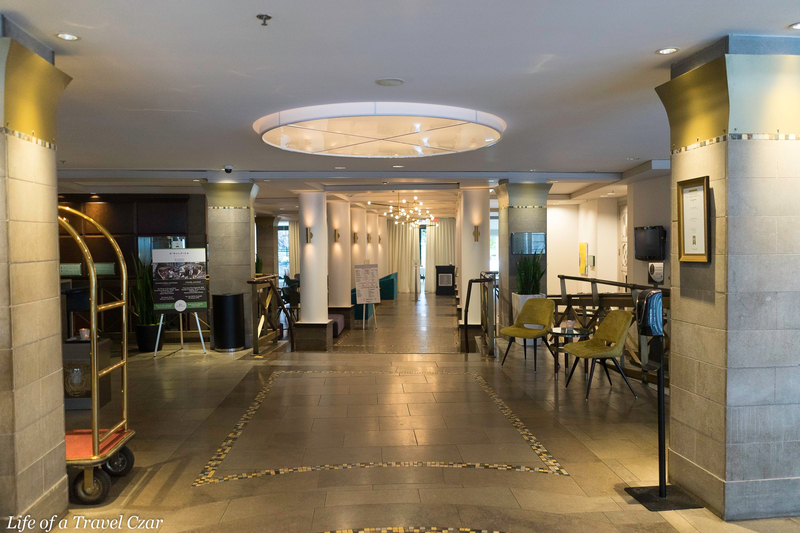 Overall the hotel ticks some key boxes for me, its in Old Montreal which is beautiful part of the city, its close to major public attractions, its pretty quiet as the room faced the courtyard and the room was quite spacious. The hotel provides complimentary water bottles and free wi-fi too. 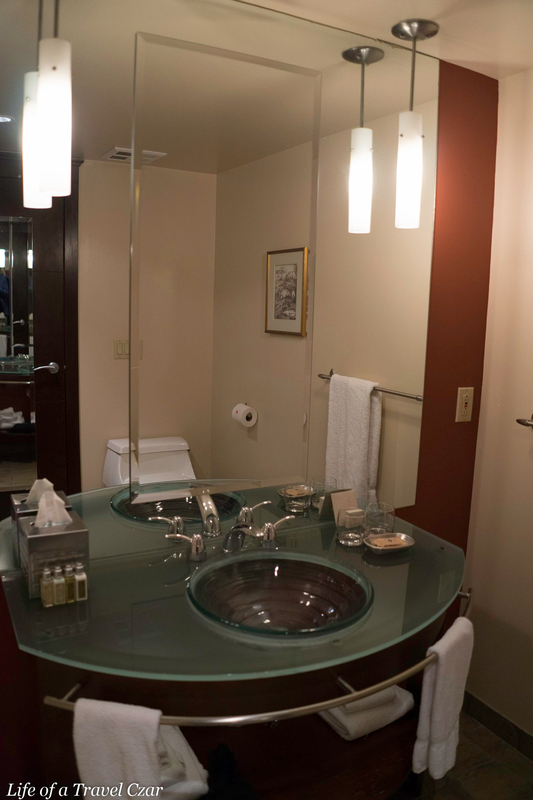 The major let down is the bathroom which lacks the sort of bling you’d expect in a suite and during my stay the restaurant courtyard was booked out for private events, so as a hotel guest I couldn’t enjoy it. 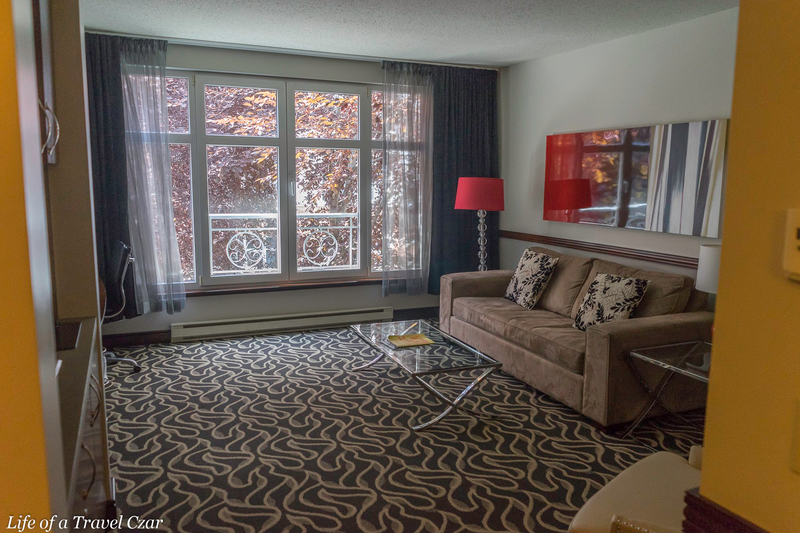 I actually spend most of the days in Montreal out meeting friends and doing dinners etc., so I probably didn’t need a spacious room, but if you’re traveling as a family or keen to just unwind in your room for the stay, then this hotel represents top value. Thank you for the nice review and the beautiful pictures! I m the marketing manager of Le Saint-Sulpice Hotel. I just wanted to precise that we started renovating our bathrooms last year. 3 floors are already finished.and unfortunately you stayed in one of our suites that is planned for 2019. I m sorry about that. 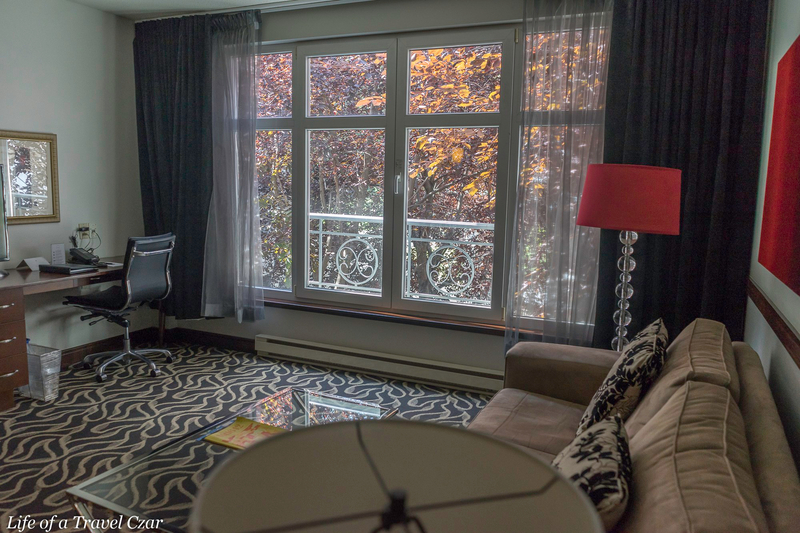 Really enjoyed my stay and look forward to visiting again next time I’m in Montreal.